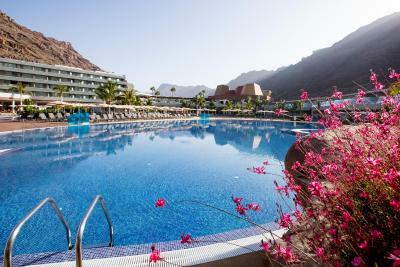 Lock in a great price for Radisson Blu Resort & Spa, Gran Canaria Mogan – rated 8.9 by recent guests! Bed was probably most comfortable ever slept in - but the sofa bed for the kids, not so much. A room with 2 queen beds would have been much better. No kids' TV channels, but did have YouTube. Excellent place for families with smaller kids to have a vacation. 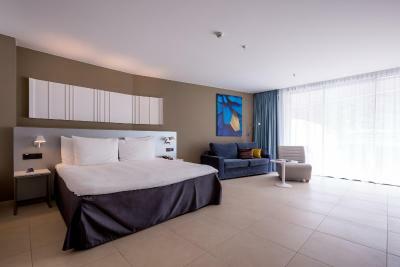 Cloud like bed, spotless room, fab amenities! Stayed for 1 night & didn’t want to leave. Never have I slept in such a comfortable bed. The toiletries selection was lovely & fluffy robes to relax in. Pools are great and never feel crowded. I will defo stay again. Bed was ultra comfortable! Animation team was fantastic and my daughter loved the kids club. Great spa experience, I recommend the Jet Lag treatment. Excellent service from staff all around! Loved the location too! Food was amazing, bed was the comfiest I've slept in, room was spacious and dining room decor was fabulous. Excellent location. 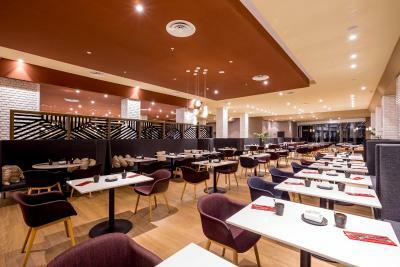 Very well taken care of and the heated looks were great! Breakfast was always good and we loved having the Prosecco offered each morning. 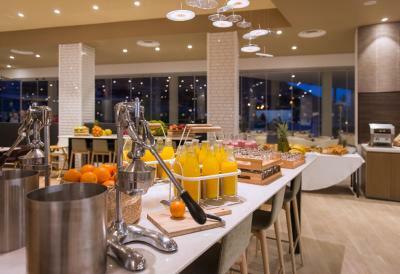 The Breakfast choices were only fab; who doesn't like to start their day with a glass of bubbly! 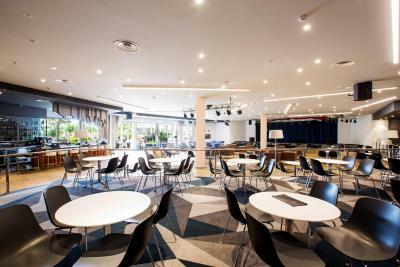 Hotel staff were all extremely helpful & friendly. I would recommend this Hotel to a Couple or a Family, as all options are catered for. Great overall experience. The room was big and very comfortable. I was actually amazed that such a thin mattress could provide great comfort. Free water was distributed everyday. We had a room overlooking the swimming pool and had the joy to see the sun rise and set everyday. There were plenty of free parking, shopping district and restaurants nearby. They had entertainment and well kept children facilities. Karoline and Alberto at the front desk were first class attendants. Very courteous, welcoming and professional. 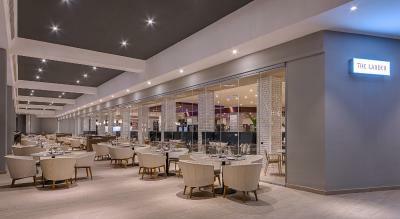 Lucilla the duty manager was very polite, professional and helpful with the various advise she shared with us. Will come and stay again here. 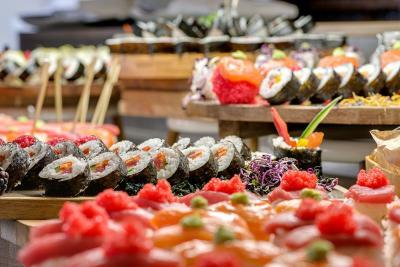 The restaurant was well varied , with plenty of fresh options. The staff from all fronts were extremely children friendly. Santiago one of the waiter was just amazing and looked well after us. 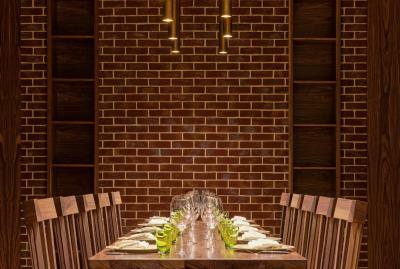 In comparison to other hotels of this pedigree, this hotel definitely pulls it off. 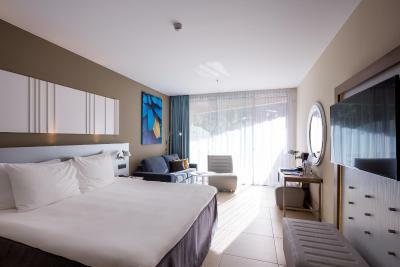 The staff is very friendly and service minded, the bed is the most comfortable hotel bed I have ever found, the rooms are big and so are the balcony. 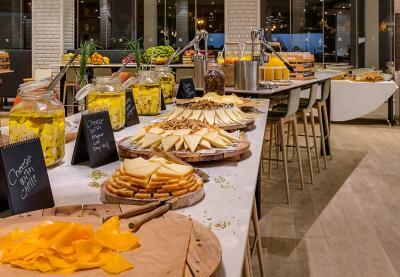 The breakfast had everything you could imagine. 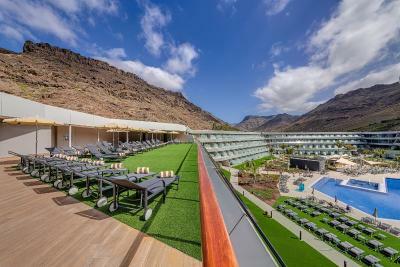 Radisson Blu Resort & Spa, Gran Canaria Mogan This rating is a reflection of how the property compares to the industry standard when it comes to price, facilities and services available. It's based on a self-evaluation by the property. Use this rating to help choose your stay! 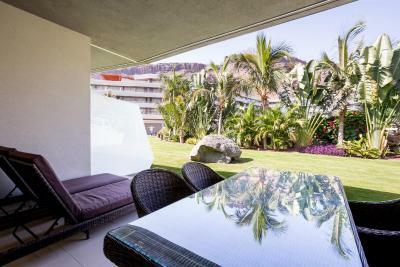 One of our top picks in Puerto de Mogán.This property is 10 minutes far from the beach. 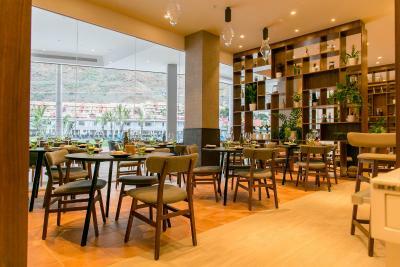 Featuring an on-site fitness center and a spa, Radisson Blu Resort & Spa, Mogan, Gran Canaria is located in Puerto de Mogan. 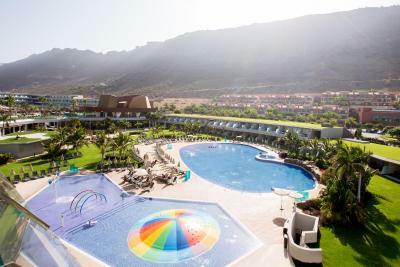 This resort offers 2 swimming pools with a hot tub, as well as 1 pool for children. 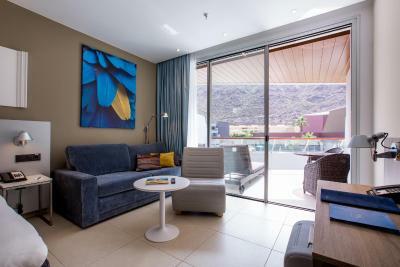 All spacious, air-conditioned rooms and suites at Radisson Blu Resort & Spa, Gran Canaria Mogan have modern décor and large balconies or terraces. 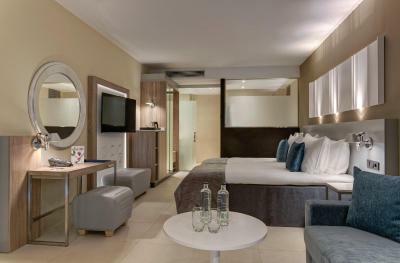 There is a seating area with satellite TV and Apple TV, free WiFi and a bathroom with a bathrobe and slippers. 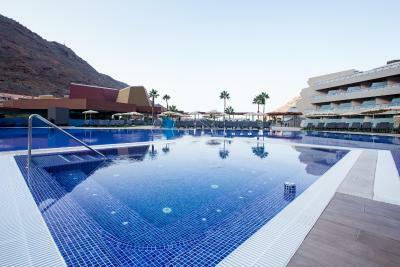 The spa features an indoor pool with water jets, a hot tub, sauna and a Turkish bath. Massages and a range of beauty treatments are also available. 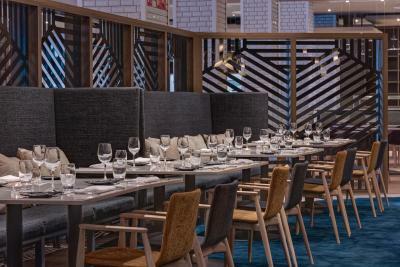 The main restaurant Larder offers themed buffet dinners and pre-show dining, while the à-la-carte Filini restaurant serves international fine dining cuisine. 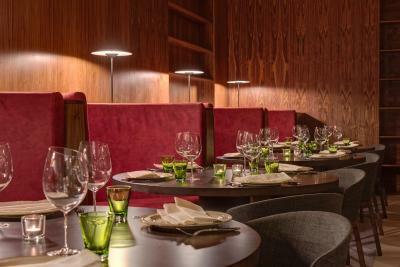 Guests can also enjoy a drink and snacks from the Pool Bar II Taglio, as well as from the Pool Lounge. 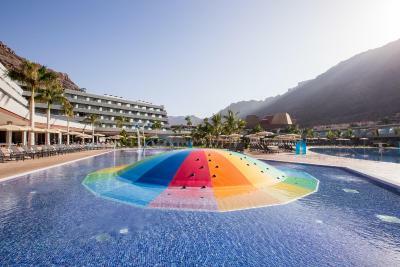 Other facilities at the Radisson Blu Resort & Spa, Mogan, Gran Canaria include a rock climbing tower, a tennis and volleyball court, and a running track. An array of activities are offered in the area, such as snorkeling, diving and cycling. 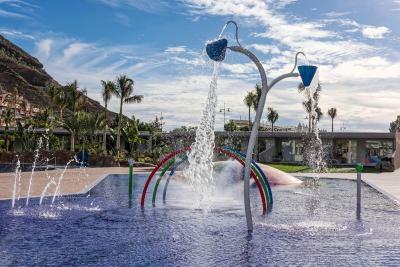 Maspalomas is 11 mi from Radisson Blu Resort & Spa, Mogan, Gran Canaria, while Las Palmas de Gran Canaria is 29 mi away. 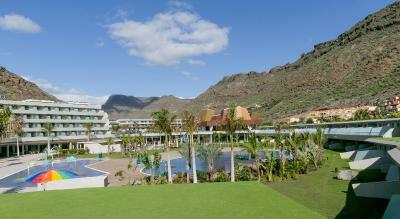 The nearest airport is Gran Canaria Airport, 24 mi from Radisson Blu Resort & Spa, Mogan, Gran Canaria. 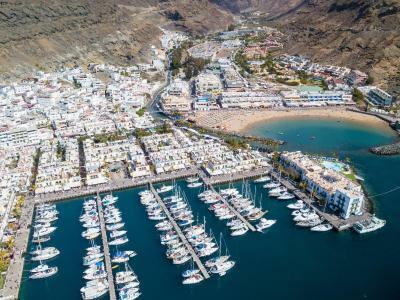 This property is also rated for the best value in Puerto de Mogán! Guests are getting more for their money when compared to other properties in this city. 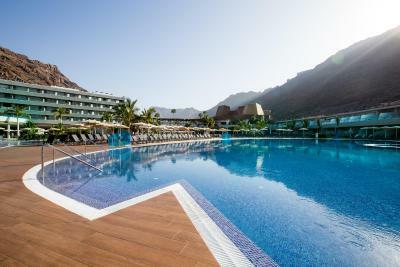 When would you like to stay at Radisson Blu Resort & Spa, Gran Canaria Mogan? 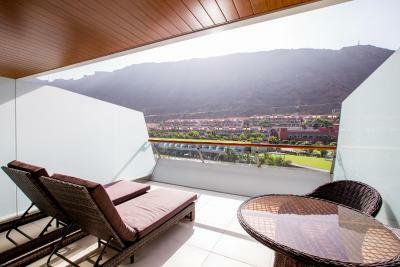 This double room features a private balcony with sun loungers and views of the mountains. It includes a large flat-screen TV and a safe. 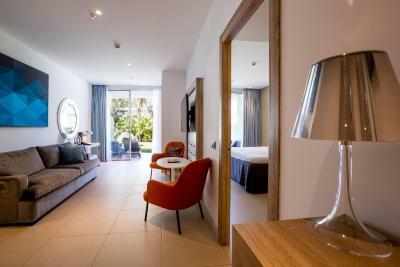 This superior room features a balcony or private terrace with sun loungers and views of the swimming pool and garden area. 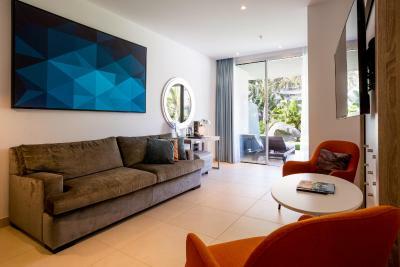 This spacious suite features a seating area, 2 bedrooms, one of them with a sofa bed and a balcony with views of the swimming pool. 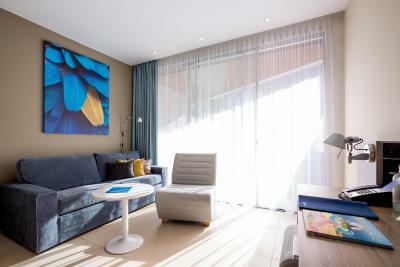 This spacious suite features 3 bedrooms, a living room with a sofa bed and a balcony with views of the swimming pool. 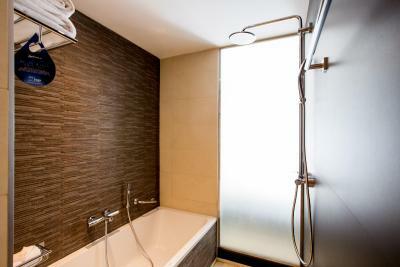 This spacious suite has 2 separate bedrooms, each with a private private bathroom. 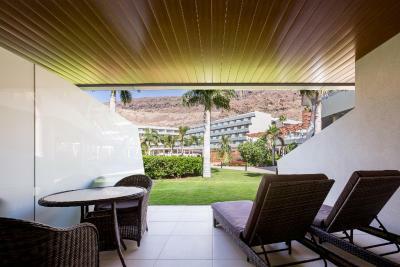 There is a spacious and furnished balcony with sunbeds and pool views. 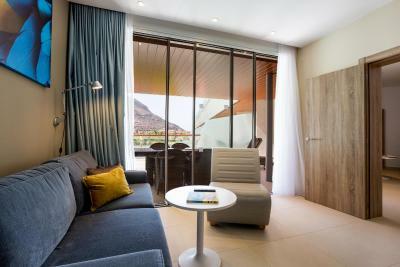 This superior suite features views of the swimming pool. It has 2 bedrooms and a seating area with a sofa bed. 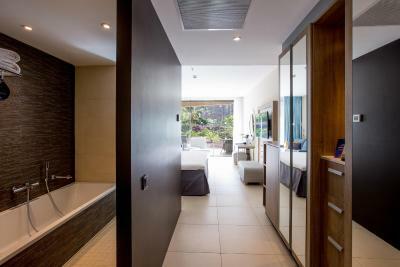 This room has direct access to the swimming pool and garden area. This spacious suite has a separate seating area and 2 separate bedrooms, each with a private private bathroom. 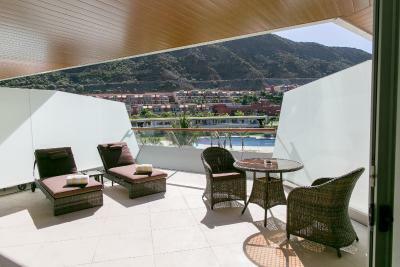 There is a large, furnished balcony with sunbeds and pool views. There are three 48 inch flat-screen TVs available with streaming/mirroring capabilities. A safe and a Nepresso Coffee Machine are also available. 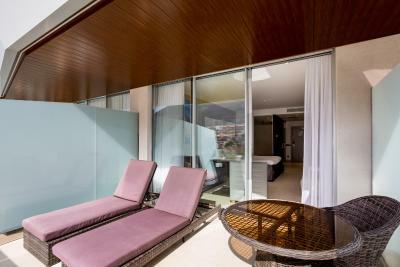 This spacious, luxury suite features a private balcony with sun loungers an views of the swimming pool. It has 3 bedrooms with an private bathroom each, and the living room includes a dining/seating area. This superior room features a sofa-bed, a balcony or private terrace with sun loungers and views of the swimming pool and garden area. It includes a 48 inch flat-screen TV with streaming/mirroring capabilities. A safe is also available. 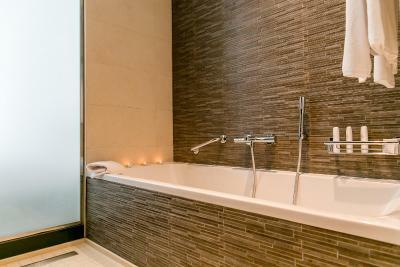 This spacious suite has a separate seating area and 2 separate bedrooms, each with a private private bathroom. 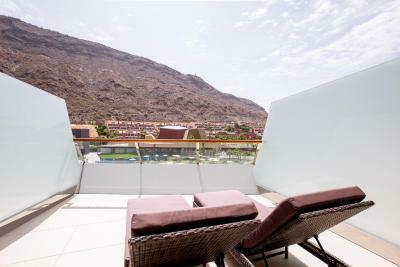 There is also a furnished balcony with sunbeds and pool views. 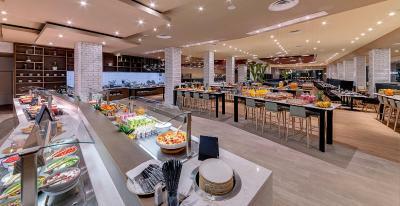 It includes 3 48 inch flat-screen TVs with streaming/mirroring capabilities, a safe and a Nepresso coffee machine. This spacious room features views of the swimming pool. 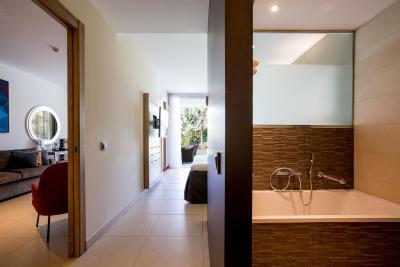 It has 2 bedrooms with each an private bathroom and a seating area with a sofa bed. It includes 2 large flat-screen TVs and a safe. 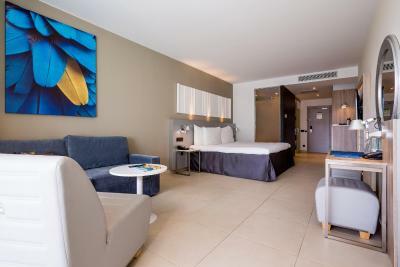 This double room is located on the ground floor with direct access to the pool and features a sofa-bed, terrace with sun loungers overlooking the Beach Pool. It includes a large flat-screen TV and a safe. 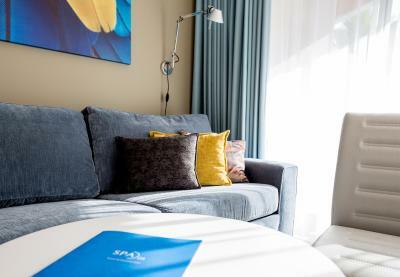 This double room is 5m2 more spacious and features a balcony, sofa and seating area. 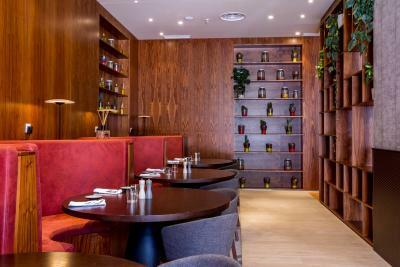 Guests can enjoy daily from the free Nespresso coffee machine in this room.